There is no ignoring the huge role that women play on the St Vincent’s campus – from Sr Maureen Walters RSC, who worked tirelessly as the Sister Administrator of St Vincent’s Hospital prior to recently heading to Sydney to continue her work with the Sisters of Charity Congregational Office, to Professor Tricia O’Rourke, who is CEO of St Vincent’s Public Hospitals. Closer to home, we have the Chairs of our Board and Foundation Board, ably led by Brenda Shanahan and Susan Alberti, respectively. We are also justly proud of our senior staff, 50% of whom are women. Any researcher worth their salt would argue that our sample size is not large enough for statistical significance and, in fact, there is no ignoring the underrepresentation of women in senior research positions across Australia. Women account for more than 60% of all applications in the NHMRC’s early career fellowship scheme, but this drops dramatically when it comes to senior fellowships – women made up just 11% of applicants for the most senior fellowships in the NHMRC’s most recent funding round. This loss of talent is a huge concern, which is now being actively addressed by the NHMRC and by many Institutes, including SVI. One of the ways we are approaching this is by providing support to our young female researchers as they face the challenge of rearing young children while keeping their research on track. In May, Dr Lorien Parker was awarded SVI’s Women in Research Award at the annual Susan Alberti Medical Research Foundation Mother’s Day Luncheon. The Award supports the work of an outstanding female scientist by providing her with technical support in the lab while she is on maternity leave. Dr Parker, a postdoctoral fellow in the Structural Biology Unit, will take leave in October for the birth of her second child. At SVI we are lucky to have senior female researchers who all run successful research programs alongside their family responsibilities. These women are a key part of our team and are excellent role models for the next generation of researchers. Recently joining the ranks of our senior staff is Associate Professor Geraldine Mitchell. Geraldine is one of 17 research staff who, along with 11 students, joined SVI thanks to a merger with the O'Brien Institute. The merger, which occurred on the 30th of April, represents a consolidation and strengthening of two research organisations that already have much in common. I look forward to keeping you abreast of our new research developments in the year to come. I would like to take this opportunity to thank everyone who has supported the Institute over the last year, many of whom are listed on the back page of this newsletter. Bones are savvy. They are light, strong, and they can repair themselves when damaged. What's more, they are continually renewing themselves, replacing old bone for new. This is not unique - other tissues (most noticeably skin) are continually replaced. However bones adjust to the body’s mechanical and physiological needs as they go. How do bones manage such a remarkable feat? Recent advances in imaging technology are starting to reveal the brains buried deep within bone: a living cellular network composed of bone’s most abundant cell, the osteocyte. Like the neurons in the brain, osteocytes have long finger-like projections burrowing through the bone to interconnect with each another. Inspired by the complexity of this cellular network, SVI’s Associate Professor Natalie Sims and her colleague, Monash mathematician Dr Pascal Buenzli, set out to quantify the osteocyte network in the human skeleton. What they found exceeded all expectations, paralleling even the neural network of the brain. The team estimated that the human skeleton contains 42 billion osteocytes. In comparison, the human brain contains 86 billion neurons, packed in a volume (1.2 L) comparable with the volume of bone in the skeleton (1.75 L), although of course the skeleton is more spread out. Adding together the length of the osteocytes’ projections, the team estimated that the entire network is about 175,000km long: more than four times the earth’s circumference. This is very similar to the total length of the pathways between brain cells. They then used a mathematical model to calculate the total number of connections between the cells. How many? Twenty three trillion connections exist in the human osteocyte network. So, in a way, our skeletons have a similar number of cells as the brain, interconnected in a similar sized space. Why do our skeletons need such a complex network? The experts don’t know exactly, but they do know that the cells exchange information, just like neurons do. We know that osteocytes communicate with each other about where the skeleton is weak and needs to be strengthened, or where there is damage that needs to be fixed. These messages are transmitted to cells on the bone surface that are able to remove damaged bone (osteoclasts) and form new bone (osteoblasts). The team at SVI will continue their research into these brainy cells, in order to find better treatments for skeletal disorders like osteoporosis or osteogenesis imperfecta, and explore ways to get people back in action more quickly after a fracture. In the meantime, the osteocytes will continue to keep our skeletons strong (and smart) enough to support us. At the end of last year, PhD student Jibran Wali was awarded the SVI Director’s Award for the student with the most outstanding publication record in 2014. This was the fitting end to a successful candidature: Jibran submitted his PhD in September 2014, with an impressive nine publications to his name. Jibran arrived at SVI in 2010 to work in Associate Professor Helen Thomas’ Islet Biology Laboratory. He came via Islamabad in Pakistan where he was raised and medically trained and then New Zealand, where he did a Masters of Health Sciences by research at the University of Auckland. His studies also identified molecular targets that might be used for drug development to treat metabolic disorders such as type 2 diabetes. Now employed as a postdoctoral researcher in the lab, Jibran has the opportunity to pass on some of his knowledge and experience to the next wave of PhD students. He intends to continue his research career the same way he has started it: full of passion and productivity. Jibran’s father would surely be proud of his son’s achievements. Anne’s partner Edie was diagnosed with early onset Alzheimer’s disease when she was 59. “Edie had been working as a driving instructor. She was the type of person who would remember things after she’d been told once, but then we started noticing that if she hadn’t written the details down she ended up going to the wrong address and getting the times wrong. Edie wouldn’t have been diagnosed if not for 2 years of insistent nagging from me. When she did finally go to the doctor she came home saying that the doctor said nothing was wrong. However, she had forgotten to mention memory problems! I ended up going back to the GP with Edie, where they did some memory tests and determined she had memory problems. After many consultations a PET scan and re-examination of an earlier MRI formalised the diagnosis. Edie had no family history of any type of dementia, and her sister responded to the diagnosis with disbelief and denial, as Edie had always been so sharp. I wasn’t surprised with the diagnosis however, as my mother had had Alzheimer’s and I was familiar with the symptoms. When it comes to coping with the disease, Edie just gets on with doing what she can. We don’t deny it, but we don’t need to be thinking about it every day. We know it’s going to progress, but it is moving slowly, which is good. We just don’t dwell on it. The first few years were spent finding the right medication, becoming part of the Alzheimer’s Australia ‘world’ and getting good medical and emotional support. At first it was very hard for Edie, as she had to quit her job as soon as she was diagnosed. Now she just goes along with it and mood-wise is more consistent. We were lucky. Even though it took 5 years from initial symptoms for Edie to be diagnosed, it was probably still at any earlier stage than many people experience. Being diagnosed early gives you time to get more information; to adjust, to plan how to manage as things progress, to explore whether or not medication has any side effects, and to live your life as fully as possible. We have travelled to Botswana, China and Vietnam since Edie's diagnosis. Professor Michael Parker and his colleagues have used the Australian Synchrotron to reveal important new detail of the structure of a drug currently in advanced clinical trials to combat Alzheimer’s disease. Michael Parker and his team revealed how the drug, Solanezumab, interacts with brain proteins associated with the development of Alzheimer’s; the findings highlight what makes current therapies for the disease effective, and show how these therapies can be improved. The team used the high-intensity x-ray beams from the Macromolecular Crystallography (MX) beamlines at the Synchrotron to visualise the structure at a resolution powerful enough to see how Solanezumab, an antibody, interacts with a toxic peptide thought by many to cause the disease. “This research shows us how the drug interacts with a peptide that forms plaques in the brain, symptomatic of Alzheimer’s; these peptides are otherwise difficult for the body’s immune system to clear,” Michael says. Michael says this level of understanding is essential and is informing the development of a second generation of drugs. Is it possible to be Fit and Fat? Well, yes it is, according to Professor Jo Salmon, Deputy Director of the Centre for Physical Activity and Nutrition at Deakin University. Joined by Jane Martin, Executive Manager of the Obesity Policy Coalition, the two headlined the fourth annual Friends of SVI Food Matters Event held on Tuesday March 31. Almost 50 people attended the event, which started with a tour of SVI labs by A/Prof Jock Campbell, Head, SVI’s Molecular Cardiology Unit and Dr Sandra Galic, Postdoctoral Fellow in SVI’s Protein Chemistry and Metabolism Unit. Following the tours, SVI Foundation Board member and Chair of the Friends of SVI support group Bernadette Dennis, welcomed guests to the event and introduced the MC, SVI Board Member Karen Inge. An accredited practising dietitian who provides specialist nutrition comments to media, Ms Inge was well-placed to direct the lively discussion that followed the formal presentations. In her presentation, Professor Salmon said that inactivity and low fitness were major determinants of illness and premature death, and that no matter your weight status or health, everyone should move more and sit less. While Ms Martin agreed that you can be fit and fat, she advised the guests that unless rates of obesity/overweight are reduced, common cancers such as bowel cancer (9% attributed to obesity/overweight) and breast cancer (17%) will increase, while rarer forms such as endometrial cancer (49%), oesophageal cancer (35%) and kidney cancer (24%) may also become more common. Thanks to everyone who participated in and attended the event. If you are interested in learning more about the Friends of SVI, contact the SVI Foundation on (03) 9231 2480. Dr Lorien Parker from SVI's Structural Biology Unit has been awarded the ‘Susan Alberti Women in Research Award’ at the third annual Susan Alberti Medical Research Foundation Mother’s Day Luncheon, held on Thursday May 7 at Leonda by the Yarra. Funds raised through the Luncheon go towards the Award, which supports the work of an outstanding female scientist by helping to ensure her research can continue while she is on maternity leave. Lorien’s research focuses on improving the properties of cancer chemotherapy drugs. Current treatment frequently requires large and long doses of toxic chemicals that produce severe side effects. These treatment regimes also often result in drug resistance, resulting in cancer relapse. The Aussie Boys entertained the guests on the day with some classic Aussie music and Dr Judith Slocombe, CEO of the Alannah and Madeleine Foundation and mother of nine, spoke about her experience of successfully combining a career in business with motherhood. She said that women need to work actively on both their careers and their family and need to learn to prioritise to allow both to flourish. "Housework has never made it onto my list," she said, "no one ever suffered from having unpaired socks." Enthusiastic applause indicated that the audience whole-heartedly agreed! On Monday May 25, more than 200 guests at SVI’s Annual Forum learnt about the Therapeutic Revolution underway in medicine. SVI Director Professor Tom Kay welcomed guests and provided a brief overview of SVI, highlighting our researchers and their work in areas such as cancer, Alzheimer’s and diabetes. Professor Sir Gustav Nossal then enthusiastically introduced the theme of the evening—the Therapeutic Revolution—and the keynote speaker, Professor Sir Marc Feldmann from the University of Oxford. The next speaker, orthopaedic surgeon Professor Peter Choong, Sir Hugh Devine Chair of Surgery at St Vincent's Hospital, provided insight into recent advances in orthopaedics. According to Professor Choong, these are dependent upon a collaborative approach with researchers from areas including materials science and mechanical engineering. Therapeutic approaches and tools include 3D cell printing, bio pens and ‘just-in-time’ manufacturing of specific implants for patients. During his presentation, Professor Michael Parker, Head of SVI’s Structural Biology Unit, spoke about his group’s Alzheimer’s disease research. Professor Parker compared neurons dying in the brain in Alzheimer’s disease to lights blowing out in a city; a single light going out may not be noticed, but the loss of large numbers of lights causes problems. He said that current approaches to Alzheimer’s therapy rely on the development of antibodies to stop neuronal death, but these need refinement through understanding of the three dimensional structure of the proteins involved – the speciality of Professor Parker’s lab. The speakers then joined a panel with Professor Geoff McColl, Head of the Melbourne Medical School and Professor Mark Cook, Chair of Medicine at St Vincent’s Hospital, and fielded numerous insightful questions from the audience. The Forum highlighted the fact that the Therapeutic Revolution is well underway, and patients will continue to reap its benefits, thanks, in great part, to home-grown talent. Susan Alberti AO is one of Australia’s pre-eminent philanthropists, having donated millions of dollars to medical research and many other charitable causes over many years. In 2015 an historic milestone will be reached with the 30th Susan Alberti Medical Research Foundation (SAMRF) Signature Ball to be held on Saturday August 22 at Crown’s Palladium Room in Melbourne. All attendees can not only look forward to a money-can’t-buy opportunity to mingle against the backdrop of a great night’s entertainment provided by Tina Arena, but they can also play their part in supporting Sue’s passion for better resourcing medical research. 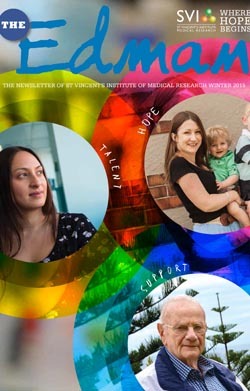 St Vincent’s Institute is one of three institutes to benefit from the proceeds of this important SAMRF fundraiser and we encourage you to attend. The SAMRF Signature Ball is always a great affair and this 30-year celebration should be on your ‘must attend’ list of events! For more information or to register, please call SAMRF on 9560 1595 or visit their website. For further information about these events, please contact the SVI Foundation on 9231 2391. Every day, more than 300 Australians are diagnosed with cancer. For all of these people and their families, the diagnosis is challenging. Unfortunately for some, it has tragic outcomes. Anthony tells the story of his brother’s battle with bone cancer. “Andrew was diagnosed with osteosarcoma in February 1995 when he was 16. He was a typically active teenager who grew up idolising the Hawthorn Football Club. He played lots of sport so when he complained of a sore knee my parents weren’t too concerned. After a couple of visits to the GP and specialists, we were told that Andrew had osteosarcoma and his chances of survival were around 75-80%. We had never heard of osteosarcoma but soon found out it was most common in teenage boys. When you hear the word 'cancer' your natural reaction is one of fear. My parents were very courageous and tried to keep a positive frame of mind; they also had three other kids in primary school so it was a juggling act to make sure we were taken care of as well. Andrew had a bone graft operation that involved replacing his knee with a donor bone, meaning he would no longer be able to run around. After receiving this news, he had to endure months of chemotherapy. Sadly, 6 months after Andrew's diagnosis we were told that the cancer had spread to his lungs. Within a year he had passed away. Osteosarcoma is the most common type of bone cancer and one of the most common childhood cancers. It impacts young teenagers and, unlike many children’s cancers, survival rates have not improved for 30 years. SVI’s Dr Carl Walkley is one of the world’s leading osteosarcoma researchers. He has developed a number of unique experimental tools which he is using to explore new treatments for the disease; therapies that are sorely needed. But to continue this research we need your financial support. Today we are asking for a gift to help Carl’s research and other projects like it. Please visit this page to donate, or for further information contact the Foundation on (03) 9288 2480.